Last time I talked about making problems visible through the four levels of visual management. I described Levels 1 and 2, which have comparatively low power. Home positions for tools & equipment are a good example. 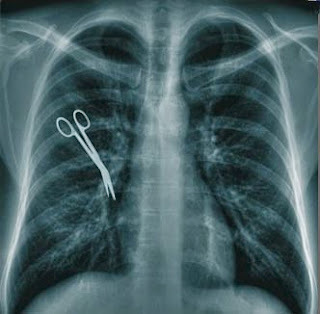 In a surgery, home positions provide a nice visual confirmation that sponges, scalpels and other equipment are back where they belong – and not inside the patient! In manufacturing, having a home position for, say, our torque wrench and gauges, ensures a) they’re there when we need them, and, as important, b) we know when they’re not there. Other good examples include the ribbed perimeters, and studded lane lines of many highways. You know at once if you’re on the median or straddling your lane. You quickly correct your behavior. Recently, I saw a nice kaizen in the Oncology department of a children’s hospital. Infections are a major risk in such wards. How to encourage staff & parents to decontaminate their hands before they enter the room? Move the hand decontamination unit to the point of entry. You can’t enter without seeing and using it, and compliance rates have spiked. Lean thinkers will recognize the ‘pokayoke’ concept. We develop such a deep grasp of our process and its possible failure modes, that we install gizmos and practices that make them impossible! Manufacturing is full of these: alarms on torque wrenches, electronic lights and safety mats that disable the machine if a team member enters the line of fire, gasoline nozzles that won’t fit diesel tanks and so on. In Health Care, pokayokes on gas lines make it impossible to mis-connect oxygen and other gas lines. As we get better at Lean, our visual management naturally progresses from Level 1 to Level 4.
Who is the best source of Level 3 and 4 visual management? Why, our front line team members, of course. That’s why total involvement is critical. Alienate the front line and you lose all their insight & creativity. Problems mushroom!